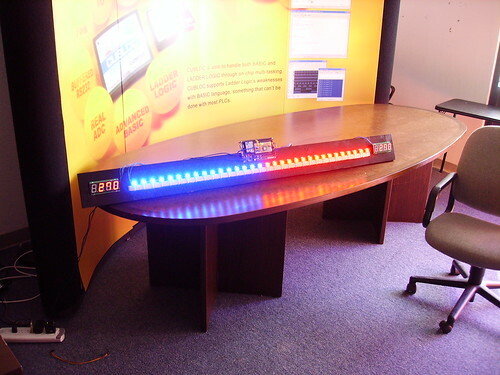 I built a giant red/blue bar graph to display the electoral vote at my house tonight. 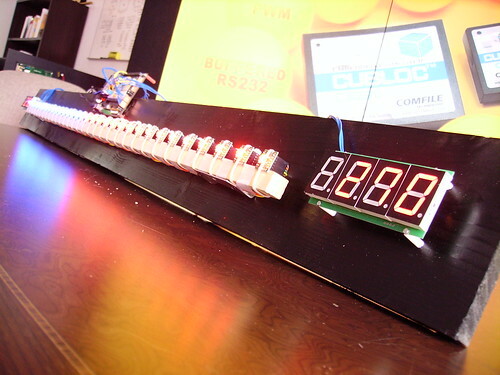 It uses 32 ShiftBrite RGB LED modules, two CSG-4M LED numerical displays, a Cubloc CB405 with Quick Start 1000 board, and an ACODE-300B Bluetooth module. I used Eric's code from Hackaday last night to scrape CNN's election results. The code runs on a small 400MHz Linux server I always have running for file storage and random scripting. I started with the above parts already listed. 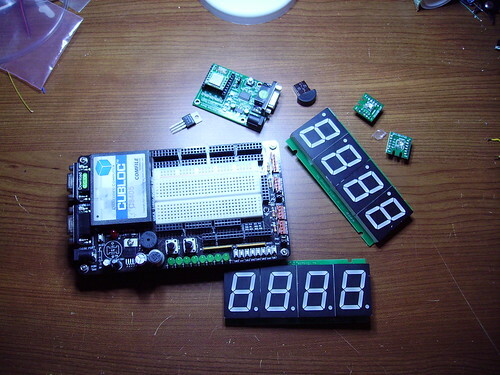 In addition, there's a carrier board for setting up the ACODE Bluetooth module, an LM1086 3.3 volt regulator for powering the ACODE module later, and a cheap (~$5) Bluetooth USB dongle from DealExtreme. Lookin' good! 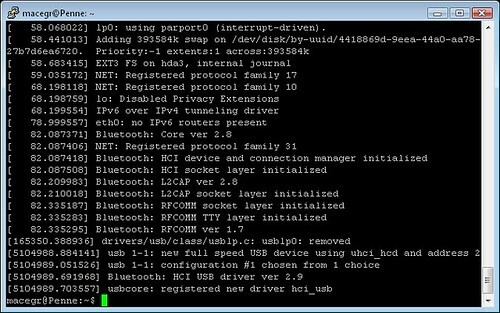 Next, let's try to get the Linux computer talking to the ACODE module over Bluetooth. 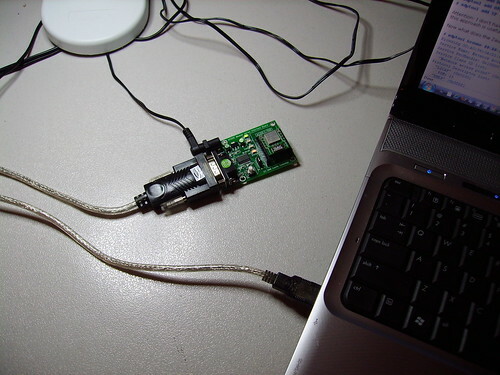 First, I plugged the ACODE module into a USB-RS232 converter and power. You can select menu items by typing the letter and pressing Enter. 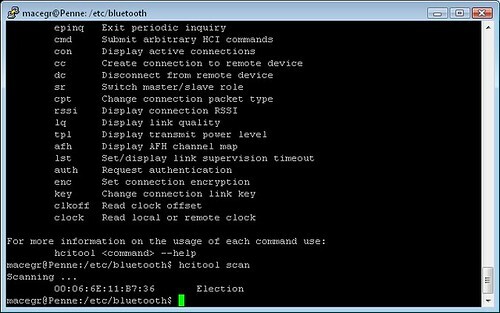 I changed the name to "Election", left authentication off, changed the connection mode to "MODE2" which automatically reconnects to the last connected device. I also disabled the status message since I didn't want to have non-data text coming into the Cubloc serial port. I made sure the role was "SLAVE" since I planned to use the Linux server as the master device. I turned the power to the ACODE on and off, and it's ready to go! There it is! I also copied the device address since it's required later. And everything still looks good. 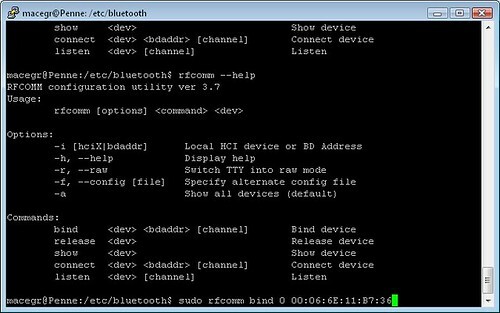 I noted that my RFCOMM service was on Channel 1, this is generally true for a single function device like the ACODE-300, but it may be different on other Bluetooth devices. 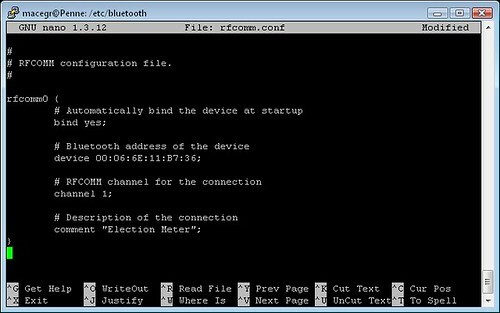 I tested the connection by echoing some text to /dev/rfcomm0, and it appeared in my local serial connection to COM4, from the ACODE-300 Bluetooth serial port. So I've definitely got a wireless link going! 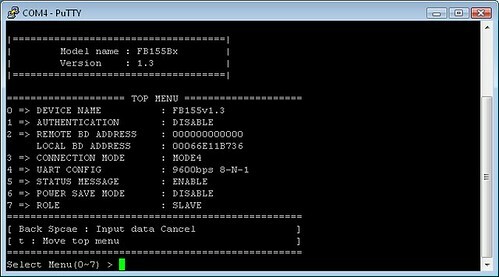 I can treate /dev/rfcomm0 as a normal serial port. This will make it easy to communicate from Python later. First, I've got to get some hardware together. 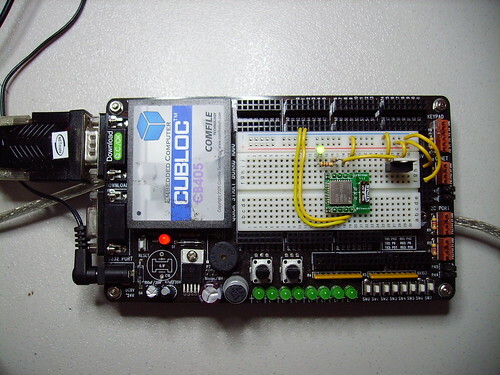 I used the CB405 and Quick Start 1000 board, and added the ACODE-300 module to the breadboard area. The ACODE module needs 3.3 volts, so I used an LM1086 regulator. It's not picky about logic levels, so I was able to run those directly into the TTL serial ports for Channel 1 on the CB405. 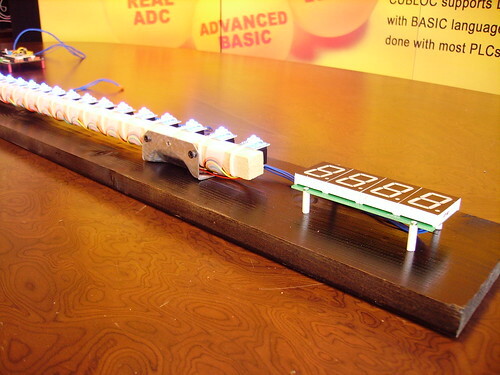 I also added a 10K pullup resistor on the ACODE Reset line, and a 100 ohm resistor and LED for the status indicator. This will blink at first, but will stay on when a connection is active. 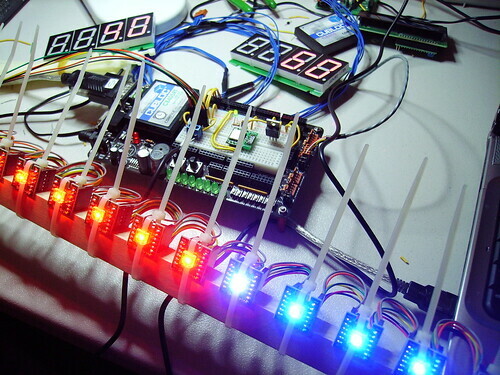 Next, I added connections for a ShiftBrite chain, hooked up the CSG-4M displays, and used some old code to test the ShiftBrites and displays. 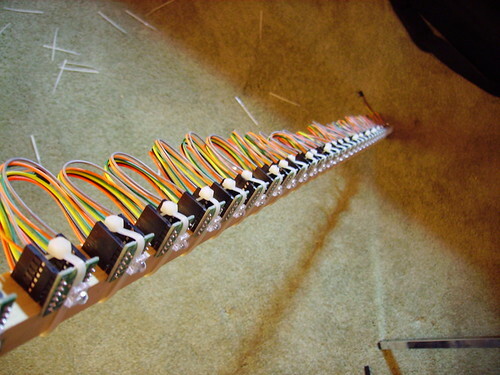 I lined up 32 ShiftBrites on a piece of 3/4x3/4 hardwood, fastened with zip ties, and chained with the 3.5" cables from my store. 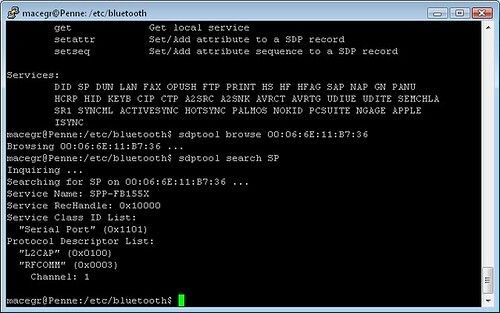 Next, I needed to process the data coming from the Bluetooth connection. I used the Cubloc's serial routines to iterate through the received string and extract the numbers and winner data. Then, I calculated the position of the bar graph and sent the color commands out to the ShiftBrite array. Finally, I fastened everything to a board. Looks pretty good! Submitted by Garrett on Tue, 11/04/2008 - 14:06. 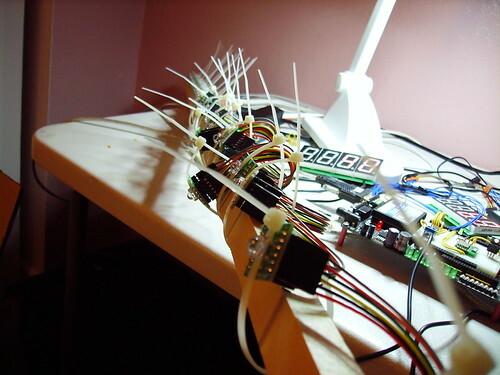 Submitted by Anonymous (not verified) on Thu, 11/06/2008 - 19:13. Too bad the election didn't turn out as great as your project. Submitted by William (not verified) on Sat, 11/08/2008 - 21:32.